It’s official! The I.C.S. have announced the subdivisions for the Holocene, so I’ve made a helpful graphic to summarise their announcement, which I’ve reproduced in full below. A high resolution copy can be found on the resources page. Boundary Stratotype (GSSP): NorthGRIP2 ice core, Greenland (coincident with the Holocene Series/Epoch GSSP, ratified 2008). Age: 11,700 yr b2k (before AD 2000). Boundary Stratotype (GSSP): NorthGRIP1 ice core, Greenland. Global Auxiliary Stratotype: Gruta do Padre Cave speleothem, Brazil. Age: 8326 yr b2k. Boundary stratotype (GSSP): Mawmluh Cave speleothem, Meghalaya, India. 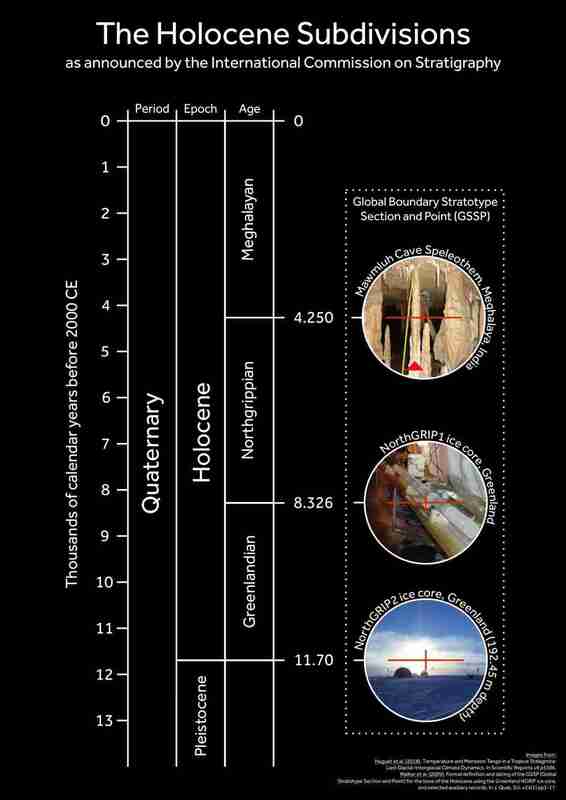 Global Auxiliary Stratotype, Mount Logan ice core, Canada. Age: 4250 yr b2k. These divisions are now each defined by Global Stratotype Sections and Points (GSSPs), which means that they are fixed in time in sedimentary sequences. The terms Greenlandian Stage/Age, Northgrippian Stage/Age, Meghalayan Stage/Age, Lower/Early Holocene Subseries/Subepoch, Middle/Mid-Holocene Subseries/Subepoch and Late/Upper Holocene Subseries/Subepoch therefore have formal definitions and boundaries. These definitions represent the first formal geological subdivision of the Holocene Series/Epoch, resulting from over a decade of labour by members of the joint ISQS (International Subcommission on Quaternary Stratigraphy) – INTIMATE Members Working Group (Integration of Ice-core, Marine and Terrestrial Records), led by Professor Mike Walker (University of Aberystwyth).